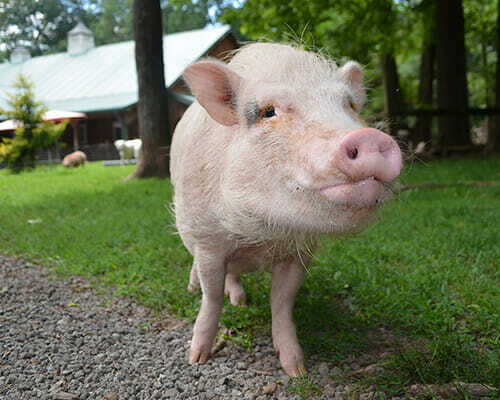 WHAT IS A POTBELLIED PET PIG? 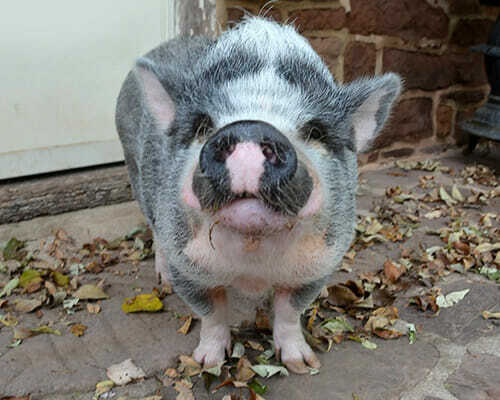 Potbellied Pigs, also referred to as Pot Belly Pig, Vietnamese Potbellied Pigs, Miniature Pet Pigs, and some have falsely call them Micro-mini Pigs and Tea Cup Pigs, are a smaller member of the pig family that have been on this earth for some 50 million years. Descendants of the wild boars of Europe, they migrated to South East Asia where they adapted to the geography and became smaller then their cousins. 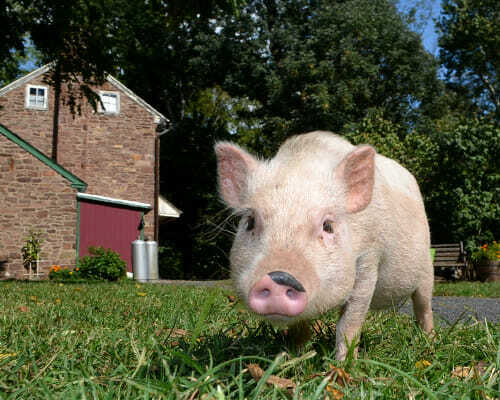 The Pet Pigs we are familiar with today in the US were first imported from Canada about 1988 and quickly became popular as a household companion pet because of their pleasant disposition, relative small size and ability to bond with their human companions. Pot Bellied Pet Pigs are not a breed but a breed type. Members of a breed, by definition, are “bred” to look as much alike as possible. A “breed type” will share common characteristics however they can look quite different from one another. 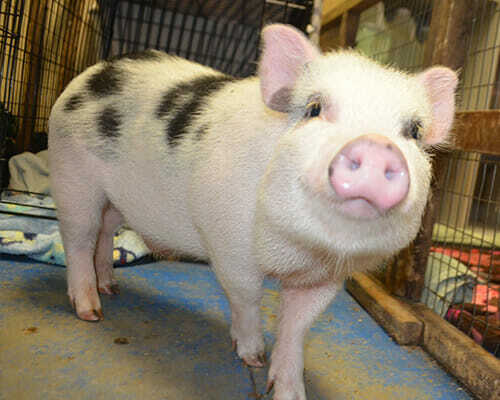 Because the pet pig is a breed type you will encounter a wide range of “looks” & In general they are small. The Potbellied Pet Pig is small weighing about 80 to 150lbs and about 16 to 20 inches at the shoulder. 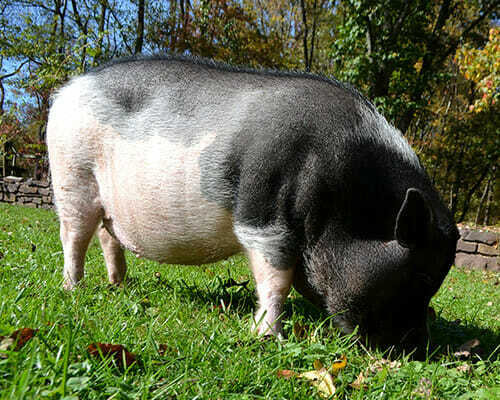 By comparison the domestic pig (hog) at maturity can weigh over 800lbs and stand over 36 inches at the shoulder. They look different than the domestic pig in several ways. Pot Belly pigs have a straight tail, somewhat sway back erect ears, a shorter snout and a curved belly that appears to hang down giving them their name. Color varies from solid black to mostly white, spotted and silver (gray appearance) They can have a lot of hair or almost no hair at all, males and some females will develop tusks, their snout can be short or long. In a word, smart. Much smarter then a dog or cat, they are considered 4th in intelligence after humans, primates and dolphins. They learn quickly are easily house-trained, understand human communication and make their feelings known. Some people consider them to be more like a 2 to 3 year old child than a pet. In fact, it’s their intelligence that makes them a challenge to manage. 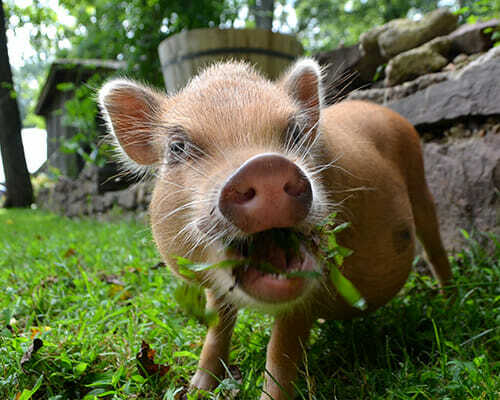 Pet Pigs have a natural gentle disposition. Because they are a herd animal they can get along well in a family situation as they treat the other members of the family as a part of their herd. Sometimes this can be a problem because they are a pray animal they may become cautious of strangers. WHAT KIND OF A PET DO THEY MAKE? Imagine that you go out for the evening. Your dog is happy to see you when you get home, your cat may not even know you were gone. Your pet pig looks at you and asks “So where have you been?”. They are not for everyone. You need the right environment, access to a good vet, the proper food, a good sense of humor, and a tolerant disposition.